Washington, D.C. – As reporters cover the just-released 2018 Social Security and Medicare Trustees Reports, Social Security Works provides you with this fact sheet that summarizes and puts in context the Social Security report’s key findings. This fact sheet updates the figures in the media backgrounder Social Security Works issued in advance of the Trustees Report’s release. Please note that this fact sheet addresses only the Social Security’s cash benefits Trustees Report (Old Age, Survivors, and Disability Insurance Trustees Report), and does not deal with the Medicare Trustees Report. In addition to reviewing this fact sheet, we invite you to speak with our president, Nancy Altman, who is a nationally recognized Social Security expert (see bio below). We also urge you to review our fact sheet that discusses, among other things, misinterpretations by non-experts caused by over-emphasis of unrealistically long valuation periods. You may also want to read Columbia Journalism Review’s “Report Card on Social Security Coverage,” written in response to coverage of the 2012 Trustees Report. The most important takeaways from the 2018 Trustees Report are that (1) Social Security has a large accumulated surplus, and (2) Social Security is extremely affordable. 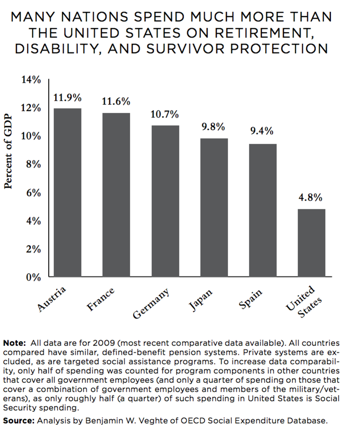 At its most expensive, Social Security is projected to cost just around 6 percent of gross domestic product (“GDP”). Indeed, in three-quarters of a century, in 2095, Social Security will constitute just 6.16 percent of GDP, according to the new report. That is considerably lower, as a percentage of GDP, than Germany, Austria, France, and most other industrialized countries spend on their counterpart programs today! In 2017, Social Security constituted just 5 percent of GDP. The report shows that Social Security is fully and easily affordable. The question of whether to expand or cut Social Security’s modest benefits is a question of values and choice, not affordability. Indeed, in light of Social Security’s near universality, efficiency, fairness in its benefit distribution, portability from job to job, and security, the obvious solution to the nation’s looming retirement income crisis, discussed below, is to increase Social Security’s modest benefits. The average annual benefit received by Social Security’s over 62 million beneficiaries is less than $16,000 this year. Consistent with that pledge, nearly 20 Social Security expansion bills have been introduced in the House and Senate just since 2015. Recently, the Social Security 2100 Act, introduced by Rep. John Larson (D-CT-01), has 170 cosponsors in the House of Representatives. The report projects that Social Security’s cumulative surplus is currently $2.89 trillion. It reports that Social Security is fully funded for the next decade, 93 percent funded for the next 25 years, 87 percent funded over the next 50 years, and 84 percent funded over the next 75 years. Without a single penny of additional revenue, Social Security will have sufficient income and assets to pay all benefits to America’s seniors, people with disabilities, and survivors of deceased workers, as well as all associated administrative costs, for around one and a half decades, until 2034, and 79 percent of all benefits and associated administrative costs thereafter. Moreover, the report shows that, with modest legislated increases in revenue, Social Security will be able to pay all scheduled benefits for the foreseeable future. The nation is facing a looming retirement income crisis where most workers will be unable to cease work without a drastic reduction in their standards of living. Over half (52 percent) of American households headed by someone of working age will not be able to maintain their standard of living in old age, and this figure rises to roughly two-thirds when health and long-term care costs are also considered. Traditional employer-sponsored defined benefit pension plans are disappearing, leaving workers with, at best, defined contribution retirement savings plans, which have proven inadequate. Around half of households aged 55 or older had zero retirement savings in 2013. Among those households age 55-64 with some retirement savings in 2013, the median amount of those savings was about $104,000, equivalent to an annuity of just $310 a month. Thus, it is not surprising that today two-thirds of senior beneficiaries rely on Social Security for a majority of their income. Social Security will certainly be even more important to tomorrow’s seniors. As important as restoring Social Security to long-range actuarial balance is, it is imperative to remember that it is simply a means to the end of providing America’s families with basic economic security. Recognizing that Social Security is a solution to our looming retirement crisis and other challenges facing the nation, serious analysts, and a growing number of policymakers and nonprofit organizations have advanced responsible, fully-funded proposals to expand Social Security.